In the summer holiday Fresh-air Fitness installed four pieces of outdoor gym equipment - 2 Riders, 1 Air Skier and 1 Double Air Walker. These pieces of equipment are suitable for children and made to a good specification. This purchase was made possible by the Sports Premium and fund raising from the school's PTA. On the first day of this term every class received an induction lesson covering safety issues and how to use the equipment correctly. The children can now use the equipment at playtimes, lunchtimes, clubs and during lessons as long as there is a member of school staff supervising them. The equipment has proved to be a popular activity as the children queue up enthusiastically to use it. Use of this equipment will increase the children's fitness, develop their cardio vascular function and improve their strength and balance. In April I met up with Russell Potter a Golf Professional at The Hertfordshire Golf Club as he had inquired whether we would like the children to receive some tri-golf coaching lessons. A date in May was arranged but we had to cancelled due to our Ofsted visit. We have booked him up again this Autumn half term and Maple class- year 3/4 are benefitting from his coaching skills also the other two year 3/4 classes are receiving tri-golf sessions from a member of staff that has been observing his lessons. Daniel Hill ( Maple) has taken some excellent photos to show the golf activities the children have taken part in. This club has started up again with the same children attending plus a few additions. We have had to change the day of our club and it is now on a Thursday lunchtime from 12.20 - 12.50. Well done to Kian Seymour who won the skipping challenge that had been set for them during the summer holidays. He won a jazzy hoola hoop as a prize for his efforts - he managed over 1,000 skips! This term we have the Combat bag which will develop agility, flexibility, balance and co-ordination. All key skills for taekwondo, judo, fencing and wrestling. We are also using the 10 min shake up activities that have been devised by the Change4life programme. A10 Active – Marcia Alcott lead a staff meeting on OAA. With the aim of helping pupils make better progress and achieve more in OAA Activities through increased staff knowledge. She started the session with an introduction to the National Curriculum and then ran a practical session with using ideas from the TOPS sport cards that staff could use in their PE lessons. The staff enjoyed this session and gained insight in the teaching of OAA. Copies of the ideas were given to the staff and resources shown to them. On Thursday 13th November Jayne Jarvis and Marcia Alcott from A10 Active came in with some mini gym equipment to lead three class sessions with the year 1/2 children. After a warm-up half the class took turns on the equipment and the other half performed travelling and balances on small and large mats. The children had an energetic session and thoroughly enjoyed it with every one of them taking an active part and increasing their stamina and agility. 10 scooters, safety equipment and a storage rack were purchased for use in the playground at lunchtimes. This action sport is a great way to increase pupil confidence and to help develop positive attitudes and healthy lifestyles. Play leaders are running a session at 1.00 2/3 times a week when the infant playground is free. This has started firstly with year 6 children and will filter down through KS2. These sessions have been largely successful and the children are keen to participate. The scooters are also used by Night Owl an after school service and for Forres Fighting Fit Club. 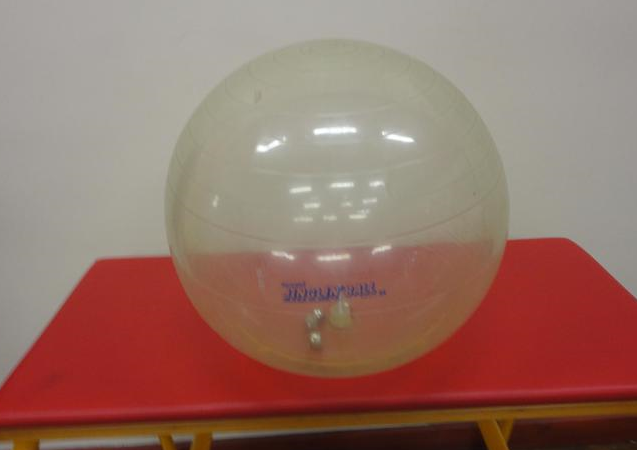 Large sound balls have been purchased for our SEND children to use in PE lessons. In January A10 Active were booked to take a staff Twighlight in Gymnastics. 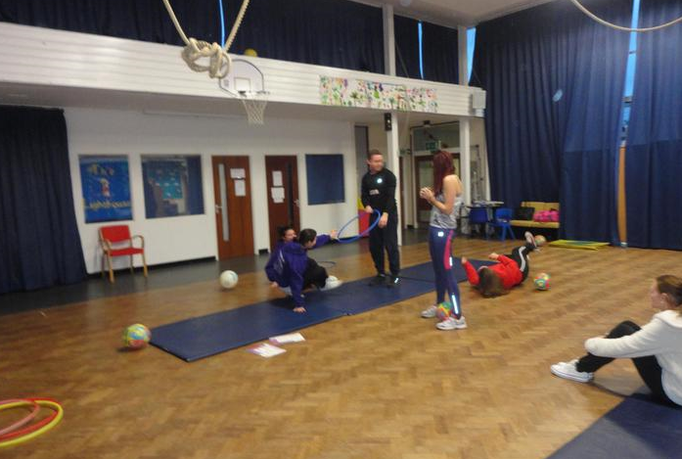 Marcia came and led the session with the aim of making the staff more confident and knowledgeable when teaching gym. She used the TOPS cards to give ideas on warm up , different themes, application and the staff took part practically. Lots of fun was had in this session and the staff were inspired to deliver future gymnastic lessons. Copies of ideas and teaching points were given to the teachers for reference.